Wendy Lamb Books (Random House), 2015. 197 pages. I’ve read at least three different books about a teen who sprouts wings, and how they deal with that. This book is different — It’s about the sister of a boy with wings. In fact, the wings are part of a family curse on all the men of the family. Twig Fowler lives in the small town of Sidwell, Massachusetts, with her mother and a brother that no one knows about. The town has plenty of tradition – including Twig’s mother’s Pink Apple Pie. But one of the traditions — the Sidwell Monster — is not so benign. James is tired of living in hiding. And Twig is tired of not having friends. When a family moves into the home of the witch who cursed the Fowler family, and they are descended from that witch — Twig and her new friend Julia decide it may be time to break the spell. But how? And James is getting more and more reckless — and falling in love with Julia’s sister Agate. This is a feel-good story, and if things worked out awfully nicely, I don’t begrudge any of them a happy ending. 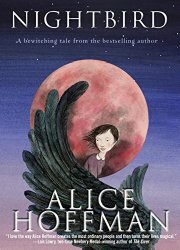 We’ve got a kid just wanting friends, a small town infused with magic, and Alice Hoffman’s brilliant writing. This entry was posted on Thursday, July 23rd, 2015 at 10:26 pm and is filed under Children's Fiction Review, Contemporary, Fantasy, Starred Review. You can follow any responses to this entry through the RSS 2.0 feed. You can leave a response, or trackback from your own site.